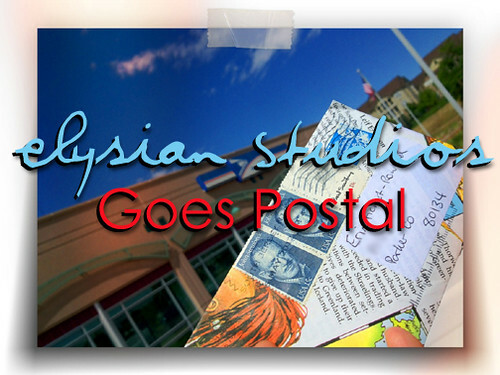 Elysian Studios: Elysian Studios "Goes Postal"
Doesn't it put a smile on your face to open your mailbox and find a handwritten letter? These days, old-fashioned "Snail Mail" is usually relegated to birthday wishes and holiday cards. When was the last time you put pen to paper and just wrote to a friend for the sheer joy of writing, affixing a beautiful stamp and watching your letter begin its journey when it slides into the mail slot? "To Receive A Letter, You Must Mail a Letter"
I always signed up for the school Pen Pal project as a child. I exchanged letters with several other children from Europe and Japan. I adored those letters. I loved it when they doodled in the margins, or included a drawing on the envelope. I exchanged letters with distant friends throughout my childhood, as our family relocated quite a bit. I have also preciously tucked away almost every letter or greeting card that was given to me by my beloved elders and children of my family. Recently, with inspiration from my friend Diane, I have rekindled my lost love of hand-written letters. For years I have been buying stamps only as I need them (which was rare), and I would just pick them up at the grocery store (which sold only the most boring, plain set). I had attempted to collect stamps as a child, but I didn't know what I was doing, so that hobby didn't last long. Recently, I stood in line and waited to speak to one of our very friendly USPS workers here in Parker, and he kindly showed me all the different stamps they currently had at that branch. He then explained that I could find more designs at the USPS Shop Online , and that is how I have now become a stamp enthusiast! 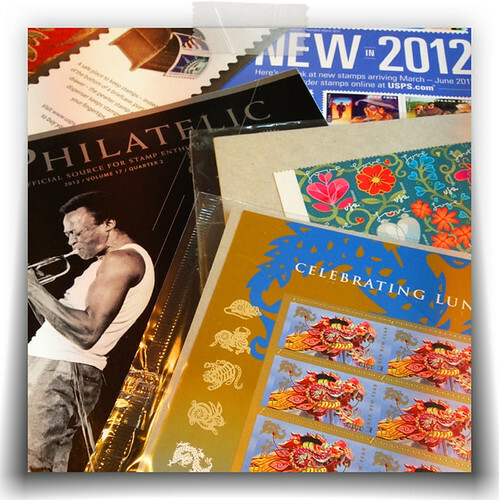 Once at www.usps.com, download or order a copy of the Philatelic Catalog, a quarterly publication, which has all of the currently available stamps with the US Postal Service. You can browse all of the beautiful designs and read the stories behind them. 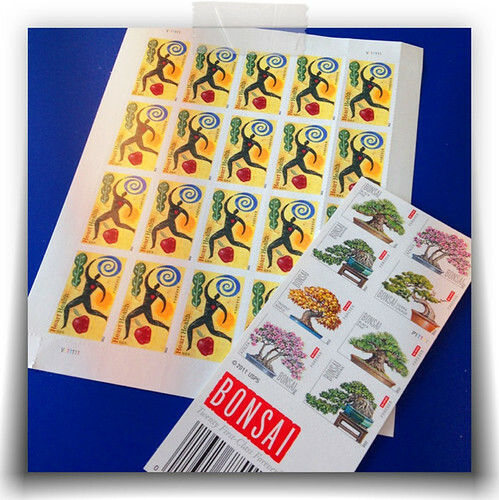 They even have a few opportunities to buy foreign postage through certain stamp programs, like the Chinese Lunar New Year collaboration with British Royal Mail or the Miles Davis/Edith Piaf Voices series with the French Post. Beyond just the "Forever" value stamp for a single letter, there are stamps of all different types of denominations for your shipping needs. And they are so much prettier on your packages and letters! I don't have a lot of Pen Pals anymore! I have signed up for the Pen Pal exchange over at the L.W.A., and over at Good Mail Day's "Call for Correspondents", but it's been a slow process getting started. If you are already in my address book, you will probably be seeing some colorful post coming your way, but I was also thinking I would see if there was anyone else out there looking to exchange a bit of mail. Mail fascinates me. From a visual perspective, I love bright colorful packages, beautiful stamps, handwritten letters, and the patterns and textures the mail receives during the course of its travels. From a communication viewpoint, I just love the idea that a cheerful, uplifting sentiment can be captured on paper and then carried by other people to the intended recipient. There's also this concept that "Art" can be freely exchanged in the mail, and it is one that I am exploring and researching. It's a bigger subject than this post was intended to handle, but if it interests you too, a great place to start is "Good Mail Day: A Primer for Making Eye-Popping Postal Art". Though I love the galleries and museums, life should see Art off the wall, in the hands of all people, and Postal Art facilitates that! Remember: "To Receive a Letter, You Must Send a Letter"
On that note, this is just a mail exchange- you will not be added to any list of any kind- just an old-fashioned address book for letter purposes only. I also reserve the right to remove my address from this post if there are any problems in the future. This is a little experiment I am doing, and I am hoping to find some other like-minded folks who would like to have a bit of fun with me! 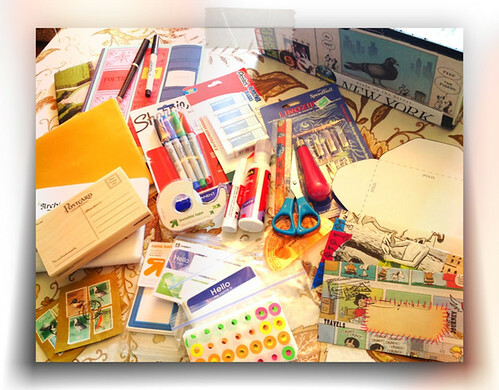 So gather some stamps and hit the stationary store! I hope to see you in the "Snail Mail!" Oh my = take it from one who knows - that Philatelic Catalog and the USPS On-line shop are very dangerous places to wander around in! Too much beautiful and enticing eye candy impossible to resist! We have amassed quite a collection of plates! I am still wrestling with the whole letter writing thing. I love sending and receiving packages but I am actually finding that i do a much better job of communicating by e-mail. Still don't understand that. But sending art - that is a beautiful idea. I am leaning more that direction! 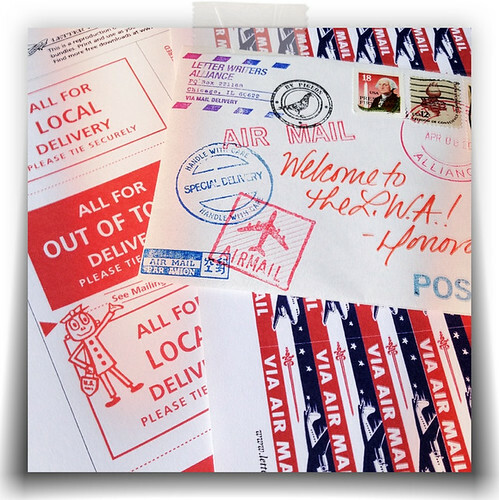 I know that many bloggers are having a very rewarding experience rediscovering "snail mail". I am still seeking the perfect place for me!! I am drawn in by your posting of love of letters and stamps. As a professional artist I love to unwind by sharing sketches and letters with other like minded spirits. You'll be getting a letter from me soon! Yea, E.M. Corsa! I look forward to your post and sending you one back! Erin, thanks for this thoughtful post, and thank you too for participating and linking to Good Mail Day! I know it can be hard to get good correspondences going, but I promise you that if you're persistent, some will stick! Like a stamp! Happy writing and many good mail days to you! I recommend the mail art network http://mailartprojects.blogspot.com/ and the Letter Exchange listing under Art and Photography. I would love to be your penpal, as well. I'm a little busy until the end of september but, if you'd like to, you can go ahead and send me your first letter. Just write me and I will give you my information.